© Copyright Susan A. Point 1990. All Rights Reserved. Born in 1952, one year after Canada repealed its ban on potlatching, Susan Point grew up in a family that actively celebrated its cultural heritage. Both of her parents used the Salish language Halkomelem in their home on the Musqueam reserve in Vancouver, British Columbia, and both participated "in the ceremony of winter spirit dance, which was the major ritual within the guardian spirit complex of Salish speaking people of the Northwest Coast area" (Gerber 1989:86). Thus, it is no surprise that when in 1981, at the age of 29, Susan decided to study jewelry making and, soon thereafter, serigraphy, she strongly identified herself as a Coast Salish artist. 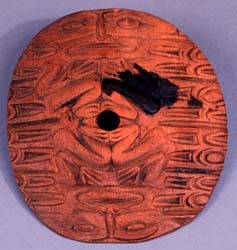 However, in 1981, most Coast Salish artists were working in a northern formline style rather than pursuing the study of Coast Salish design techniques. Northern design had already proven to be popular on the art market, and examples of traditional Coast Salish art, both historical and contemporary, were relatively hard to find. The reasons for this are complex, having to do with the private and sacred nature of most Coast Salish art, and the history of contact between Coast Salish, Euro-American and Euro-Canadian cultures. Point joined a small group of Coast Salish artists, including Stan Greene and Rod Modeste, who shared a common interest in reviving their culture's design traditions. As little scholarly work on Coast Salish art had been done at this time, Point conducted her own research. She visited the University of Vancouver's Museum of Anthropology and the Royal British Columbia Museum, and explored their collections of Coast Salish objects. She studied slides from museum collections in Canada, the United States and Europe, and looked at historic photographs for further insight (Duffek 1993:226). In her artist's statement she writes: "I, a Coast Salish artist, devoted a great deal of time to researching, trying to revive the art form, attempting to educate the public and my children to the fact that there is another form of native art unique to British Columbia." In addition to reviving Coast Salish design, Point together with a small group of artists including Stan Greene, Rod Modeste, and Floyd Joseph, among others, have brought out aspects of Coast Salish culture that had not previously received much scholarly attention. Point's incorporation of Salish mythology into her prints has made evident great cultural differences between Salish society and the crest-oriented societies of the north. Thus, Point has directly contributed to a greater awareness of not only Coast Salish design principles, but also Coast Salish culture in general. Initially, Point's work relied heavily on the cultural artifacts she encountered through her scholarship. She carefully copied designs from spindle whorls, (objects like the one on the left), rattles, combs, and mat creasers, slowly drawing out the language of Coast Salish design (Duffek 1986:3). Trigons, ovals, and crescents were used to render a two-dimensional image on paper, in much the same way they would have been used to create a carved image on a spindle whorl. With many of Susan's earliest serigraphs, it is possible to compare the print with the object, often a spindle whorl, which inspired it. In most cases, Susan has distilled the original representation down to its basic elements, rendering her design with "a subtle stylization, cleaner lines, and a greater integration of forms in her two-dimensional version of the piece" (Duffek 1986:4). In her representations of designs found on spindle whorls, Susan has managed to retain the sense of motion that would have been inherent to a spindle whorl in use. Her compositions, even those that are not derived from her study of spindle whorls, contain a sense of movement in their repetition of images and patterns. There is a flow to her lines that suggests more than an understanding of historic design elements; they manage to convey some of the essence of the original object itself. Over time, Susan began to experiment, with her compositions, her use of color, her media, and her personal style. Throughout, however, her use of a Coast Salish design vocabulary has remained constant. The following images illustrate Point's approach to Coast Salish design and subject matter as it changes over time. 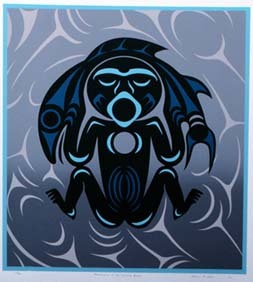 They show how Point has successfully adapted design principles traditionally used in carving to the media of serigraphy, and they present various aspects of Coast Salish cultural production and mythology. The first fourteen images are accompanied by a brief analysis. These are followed by five thematic comparisons and five groupings based on various aspects of the art works.